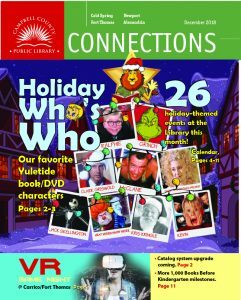 It’s a fun and festive holiday season at Campbell County Public Library. Historian Chris Burns discusses “The Life and Legacy of Ulysses S. Grant and the Women Who Helped Forge the Man” 6 pm Tuesday, Dec. 4,at Cold Spring. Families, especially young ones, can celebrate Noon Years Eve 11 am Saturday, Dec. 29, at Cold Spring and Newport. The Children’s Theatre on Tour presents “Reindeer Games” 2 pm Saturday, Dec. 8, at Newport. ASL interpreters will be on hand for the benefit of our friends in the Deaf community. Try our Virtual Reality games at VR Game Night, 6-9 pm Friday, Dec. 28, at Newport. It’s fun for the whole family at Holiday Humbug Hullabaloo, 1-3 pm Saturday, Dec. 8, at Alexandria.